Can this woman convince 195 nations to save the planet? BONN, Germany -- U.N. climate chief Christiana Figueres strode into a makeshift office she uses when negotiations are held here, preoccupied by the latest procedural skirmish in the long-running debate over how to save the planet. Compact, with short brown hair, Figueres cuts an imposing figure despite her soft pink suit and 5-foot frame. She was tense at first, almost visibly trying to put the squabbles behind her and focus on the task at hand: convincing yet another journalist that an ambitious global climate change accord must be struck in Paris in December, and will be. Distractedly shuffling papers, she mentioned that she starts her mornings by either meditating or marathon training. And just like that, Figueres has found her metaphor. Christiana Figueres, executive secretary of the U.N. Framework Convention on Climate Change. Photo courtesy of UNFCCC. "It's very difficult for me to balance urgency with patience, and I think that is at the root of this whole process. We're all so aware of the urgency of response, and at the same time, we're all painfully aware of the complexity of this," she said, settling down to talk. Trying to provide an analogy between her daily routine and her role in shepherding an international agreement that will keep global greenhouse gas emissions at safe levels, Figueres leaned forward. "If you look at meditating as getting into the patience part, and running as getting the urgency part or fast pace, that's how I take it to my own personal level," she continued. "In the ideal, I should be able to both meditate and run. That is, the system should also be able to run at the pace that is necessary, but also do it with the thoughtfulness and awareness of the complexity." Colleagues say Figueres, 59, always energetic and on message, is also warm. She can be a spontaneous dancer, and emotional. She is a frequent and unapologetic crier, welling up twice in a series of recent interviews. Figueres' admirers say they have no doubt the passion behind her tears is genuine. Her penchant for metaphors comes from her father, three-time former president of Costa Rica, José Figueres Ferrer. He had a gift for it, a "genius," Figueres said, while she works constantly to make visceral connections between the seemingly abstract and long-term threats posed by rising global temperatures and the concrete impacts on people's lives. It's a critical skill for someone in her position, charged with guiding 195 countries toward a global agreement on climate change in December. If the executive secretary of the U.N. Framework Convention on Climate Change can be likened to a coach, Figueres is leading perhaps the most important but tumultuous team in history. Not all the players trust one another. Some don't believe they are on the same team. Few of them even agree what a win looks like. But Figueres said she always tries to keep the goal in sight. "Very often I wake up in the morning, and in my mind's eye I look down at the planet as if I were the atmosphere," she said, without a hint of irony. She recited from memory the objective of the 1992 U.N. climate convention to stabilize greenhouse gas concentrations in the atmosphere at a level that would prevent dangerous interference with the climate. "How that's done is where I need to be neutral. That it needs to be done, there's no choice around it, and the fact that it needs to be done in a timely fashion, there's just no choice around it," she said. Observers say the Costa Rican native and trained anthropologist has been able to walk a fine line between being an passionate advocate for the planet and a dispassionate referee to countries battling over money and atmospheric space. "In essence, she's helping those who are the largest emitters accept that they have to do something else, and developing countries that have resisted change to accept that they can't have the same development pattern," said Farhana Yamin, an international environmental lawyer who has worked with Figueres since the first U.N. climate conference in 1995. "She's kind of said, 'Being neutral is not my job. My job is to agitate for support.' And she's quite political about it," Yamin said. "She's not picking sides, but she's asking everybody to act." Rachel Kyte, the World Bank's special envoy for climate change, said Figueres has managed the art of holding leaders' feet to the fire while not antagonizing them. "I think she's very good at emotionally closing the door," Kyte said. "She doesn't give you any space to believe it isn't on your watch. I've seen her in small rooms, challenging people, masters of business and politicians. She holds up a mirror to all of us and says, 'What are you doing here?'" Perhaps the most common description that comes up when negotiators describe Figueres is "optimistic" or even "relentlessly optimistic." Figueres herself agrees with the assessment but insists she's not irresponsibly so. Building morale in the United Nations and worldwide, she said, has been a key part of her job. 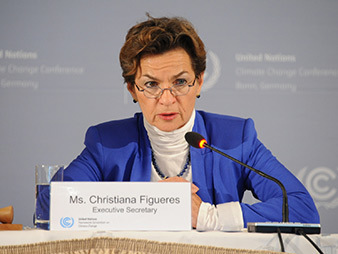 A former climate negotiator for Costa Rica, Figueres took the reins of the UNFCCC in July of 2010. It was a dark time for those who had hoped countries would sign a new international treaty the previous year in Copenhagen, Denmark. Figueres said the memories of demoralized U.N. staff, activists and diplomats haunt her and spur her still. "I remind myself constantly that I inherited this process after Copenhagen. Frankly, I inherited a garbage can. The whole process was in the garbage, the morale of the world around being able to face climate change was in the garbage can, and the morale of my fantastic staff was in the garbage can," she said. "Turning the global mood on climate change around was my absolute first priority," she said. "Five years later, we are where I wanted to bring us, to a realization that yes, this is complicated; I never said it was going to be easy. But doable." U.S. Special Envoy for Climate Change Todd Stern agreed, saying Figueres has injected a positivity into the negotiations. "She's a professional, and she has got a real and evident passion for the issue. That comes through in most everything he does," Stern said. "She projects a real can-do attitude. She doesn't project hand-wringing, and she doesn't pull punches. If she thinks there are problems, 'We aren't doing X,' she says it." Monica Araya, a former Costa Rican negotiator who joined the delegation after Figueres left, credited her diplomatic skills for ratcheting down the levels of distrust between rich and poor countries after the chaos of Copenhagen. "As a Costa Rican observing another Costa Rican, she can be very much in the camp of 'no drama,' and I like that because the UNFCCC has this kind of addiction to drama. I think that's very human, but it's not helpful sometimes, and I like that she can defuse it," Araya said. She recalled a 2012 negotiating session in Qatar in which the low grumble of diplomats that the host country wasn't handling things well grew to a roar and threatened to dismantle the talks. Figueres remained upbeat, insisting that countries would find a way to successfully wrap up a deal to move forward on a Paris accord, which they finally did. Observers say that even with countries still so far apart on dozens of issues just one month ahead of the Paris talks, no one will convince Figueres that this is the time to panic, either. "She's the daughter of a president of a country that got rid of an army. Being a Figueres in my country is a little bit like being a Kennedy in that it comes with expectations you will do things for society," Araya said. "I am convinced Christiana Figueres is a woman on a mission. Between now and then, she will do everything possible to convince the world it is now or never," she said. Born eight years after her father banged a mallet into a wall to symbolize the end of Costa Rica's military regime, Figueres said she still credits him with teaching her about leadership -- specifically, that policies are not academic exercises but directly affect people's lives. "I just remember so many times going with him to the rural areas of Costa Rica and sitting down in peasants' homes. We went very often; he would walk through [villages], and he never wanted bodyguards or anything like that," she recalled. "People would say, 'Don Pepe, Don Pepe, come in and have coffee!' He was completely addicted to coffee. And he would walk in and sit down and have coffee," she said. "Sometimes he didn't feel he had had enough coffee, and literally he would knock on someone's door and say, 'Excuse me, can I come in? I need some coffee.'" The drive comes from her mother, Karen Olsen Beck, who is 85 and, Figueres said, "sometimes has more energy than I do, and I'm not exactly unenergetic." A former ambassador, Beck also taught her children protocol, which Figueres said she chafed at as a child but now appreciates every time she has dinner with a head of state. But the ability to combine data and facts with narrative and emotion, Figueres said, was her father's special gift. She remembered as a teenager watching the country's finance minister flail in a televised address detailing the country's budget woes. The next day, she said, her father took to the airwaves and told Costa Ricans that for the next while, there would be no butter for their rice and beans. "We Costa Ricans, we eat white rice and black beans all the time," Figueres said. "That was, I think, a stroke of genius to explain to everybody that we have to tighten our belts. Everybody understood." Pausing to dry her eyes, Figueres said she still has a strong spiritual connection with her father, who died in 1990, and said he speaks to her when she needs to find a way to make the climate threat visceral. Figueres was completely sincere when she stopped in the hallway of the U.N. conference center the next day to expand on her comments and said she has a recurring dream of seven pairs of eyes watching her. "It's seven generations, and they're asking me, 'What did you do?'" she said, once more tearing up. "That's the point. I really want everybody to answer that question to those seven little pairs of eyes."